One of the most versatile ways of clamping irregular -shaped parts is with use of soft jaws. 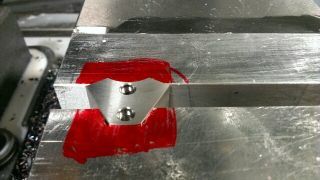 In this one I had to machine a triangular-shaped part from two sides. 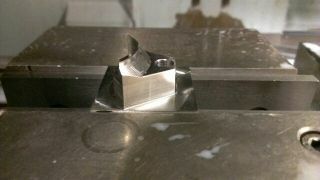 It is going to be some sort of a part holding jaw for a robot. 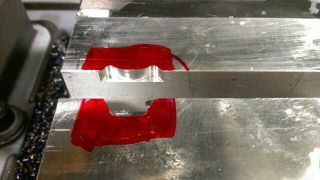 So step one: Machine one side of the part in vise. hold on to 1/8" of stock. So make sure to cut your part on a bandsaw oversize. 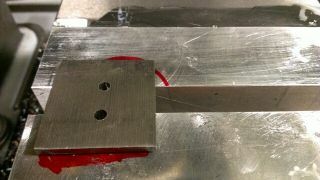 Step Two: Bolt soft jaws to your vise and machine a pocket using outside contour of your part. Be sure to relieve corners. Step three: Clamp your part in the soft jaws and machine the second side of your part. One important thing to consider is: this method is not very accurate. depending on the size and a shape of your part you may be able to hold it within 0.001" though. See attached photos of the steps below.